The 3T Exploro is built for speed and comfort on both the road and on trails beyond the reach of classic road bikes. Exploro pairs clearance for big tires to conquer any surface with aerodynamic shapes that work at real speeds - as low as 30 kph - in real conditions. Exploro accepts both 700c and 650b wheelsets and tires can range from 28 mm road slicks to 2.1″ MTB knobblies! We've built up this frameset with components that match it's capabilities - Shimano's Ultegra Di2 groupset and 3T's Discus Alloy C35 aluminium wheels. Check out the full specs in the bottom tabs. Note: The Exploro is often built to customer specification. We encourage you to call or email directly to discuss your wishes. Why is aerodynamics important on mixed-surface (asphalt, gravel, fire roads, single track) rides? You may go slow off-road, but on the connecting asphalt sections you need road riding speed. If you’re going slow because of gradients, aero indeed doesn’t matter. But often you go slow due to head- or crosswinds, so you're slow relative to the ground but very fast relative to the air and that’s what counts in aerodynamics. The key to the Exploro’s speed is the aero downtube that is wide enough to catch the airflow coming off the big front tire (a skinny downtube wouldn’t even touch the airflow). But at 50mm wide, we cannot use a full airfoil shape as the tube would be 150-200mm deep, causing too much surface drag. 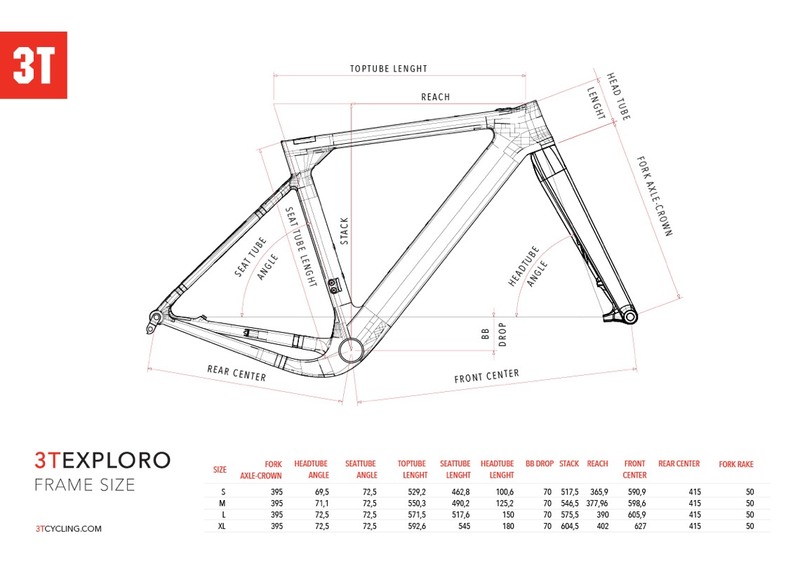 So we square off the tail, keeping most of the aero performance with a 50x75mm cross section that is also close to perfect for strength and stiffness; our Sqaero shape. The wide downtube also effectively shields the water bottles. We didn’t want the Exploro to be fast in theory, but in the real world. So we tested at a realistic 20mph (32kmh) instead of the standard 30mph (48kmh). We also optimzied the frame for water bottles (tough to do long, epic rides without them). We even designed the Sqaero shape to work well when covered in mud! The Exploro uses Sqaero 50/25, with a 50mm wide downtube perfect to pick up the airflow coming off a wider cross or mtb front tire and lead it on to the water bottles. The seattube is 25mm wide to make it aerodynamically disappear in-between the bottles and the rear tire. The headtube, seatstays and custom seatpost also use Sqaero shapes. The result? A muddy Exploro with 40mm knobby gravel tires and 2 water bottles is faster than the equivalent clean round tube bike is with 28mm slick road tires and without bottles. Exploro offers the most responsive ride ever on gravel thanks to its super compact performance gravel geometry: short 415mm chainstays and agile steering ensure phenomenal acceleration and grip on loose dirt as well as asphalt. RACE: run one bottle on the bottom two bosses of the downtube for the best aerodynamics with the bottle close to the bottom bracket. EPIC: move the downtube bottle to the top two bosses to make room for a second bottle on the seattube. For mechanical efficiency and safety, just make sure the Charlie seatpost is visible through the Checkpoint. Even if the seatpost is cut and the minimum insertion on the post is no longer valid, the Checkpoint Charlie will show you the correct minimum insertion. These give the the possibility to attach a small toptube bag onto the frame without having to use straps which may interfere with your knees. Several bag manufacturers make toptube bags in different sizes following this standard, so the choice is yours. Especially out on the trails, putting the rear wheel back into the frame can be a pain. You need to line up the disk rotor on the left while juggling the derailleur, cassette and chain on the right and holding your bike upright. The Hange Loose Hanger allows you to focus only on lining up the disk rotor, then put the wheel in, slide thru the axle and finally hanging the derailleur back with the wheel already securely in place. Job done. CHAINRING FIT These parameters apply to round rings; oval rings come in various shapes and need to be measured individually. Included in Box: Frame, fork, seatpost, seatpost internal clamp, front thru axle, 1 front and 2 rear derailleur hangers, front derailleur cable liner, noise-cancelling foam sleeve for rear derailleur housing and brake hose.